In addition to saphenofemoral reflux and valve incompetence causing symptomatic venous reflux disease, there are several sites along the greater saphenous vein and lesser saphenous vein where there is potential for branch varicosities and communication with the deep veins of the lower extremities. Free communication as well with deep veins to non-saphenous veins in the legs can also occur with perforator venous insufficiency. These include the perforator veins. 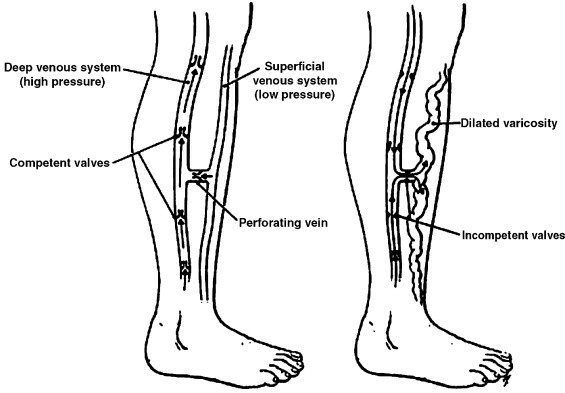 Perforator veins allow communication between the superficial venous system and deep venous system of the legs. Superficial veins include the great saphenous vein and its branches and the lesser or short saphenous vein and its branches, as well as other non-named superficial veins in the legs. The deep veins of the legs include the common femoral vein, femoral vein (previously called the superficial femoral vein), popliteal vein, anterior tibial vein, posterior tibial vein, and peroneal veins, among others. So what does the "perforator" terminology mean? It means that the vessel "perforates" the aponeurosis of the muscle, giving it the name. The aponeurosis is fascial tissue that invests or envelops muscle groups and binds these muscle groups to other muscle groups or to bone. The perforator veins 'pop through' the muscle fascia to connect with the superficial veins. The normal flow pattern is for the superficial veins to drain into the deep veins of the legs through these perforator veins. However, when the perforator veins leak, i.e. perforator venous reflux disease, bllod in the deep veins leaks through the perforator veins into the superficial veins of the legs, causing venous hypertension. According to Dr. Alberto Caggiati (Rome, Italy), perforator veins were not identified nor described by the 'fathers of vascular anatomy and physiology' in the 16th and 17th centuries. Perforator veins were first reported in the Anatomische Tafeln zur Beforderung der Kenntniss des menschichen Korpers (Weimar, 1794-1803), the main work of the German anatomist, Justus Christian Von Loder (1753-1832). The average number of perforator veins per extremity is highly variable and reported in the literature to be as many as 155 ! Obviously, not all of these are clinically important, but some can cause significant morbidity to the patient with untreated venous insufficiency. Perforator venous reflux is thought to play a fundamental role in the development of varicose veins, trophic changes in the legss and in some people, venous stasis ulcers. Other trophic changes include hyperpigmentation and brown discoloration of the lower legs, lipodermatosclerosis and venous stasis ulcers. Lipodermatosclerosis is the condition resulting from longstanding venous insufficiency with thickening (sclerosis) of the skin (derm) and fatty tissue (lipo) of the leg ---->>> lipodermatosclerosis. A recently published study from Zagreb, Croatia (Croat med J 2005; vol 46: page 245-251) showed that deteriorating venous insufficiency of the great saphenous vein correlates with the number of incompetent perforator veins per leg as well as the diameter of the perforator veins. This implies that the presence of perforator venous reflux represents a significant factor in the development of venous reflux disease in the great saphenous vein. Other conclusions also derived from this seminal study are that with the deterioration of CEAP grade, a scoring system for venous disease, there is an increased capacity for blood volume to be expelled down a pressure gradient through both dilated low-resistance incompetent perforators and the incompetent greater saphenous vein. As such, if surgery is limited to the great saphenous system alone, surgery would be insufficient. Perforator surgery should be added when there is coexistent or clinically obvious perforator venous reflux disease. Perforator venous reflux disease can be sought for and diagnosed with advanced techniques used by registered vascular technologists under the guidance of a Board Certified Phlebologist. Why is perforator surgery important? It has been estimated that in patients who develop chronic venous insufficiency, 4% will progress to develop venous stasis ulcers. That is a high number, signifying that 1 in 25 people who have chronic venous insufficiency will develop these venous stasis ulcers. Venous stasis ulcers are debilitating and require lots of medical attention - specialized bandages and dressings, multi stretch compression garments (2 layer, 3 layer, or 4 layer) and other treatments like electrical stimulation therapy, hyperbaric oxygen therapy and so on. Treatable superficial venous reflux disease is associated wtih perforator venous reflux disease in approximately 77% of patients with venous stasis ulcers and 57% of patients with trophic changes in the legs (hyperpigmentation, lipodermatosclerosis). The conclusion from this data is that patients with venous stasis ulcers and trophic changes with combined superficial venous reflux disease and perforator venous reflux disease benefit from treatment of perforator veins. image of the named veins of the legs, on the left is the anterior aspect of the thighs and legs; the right image is the posterior aspect of the thigh and leg - taken from alaskaveinclinic.com on November 14, 2009 (image changed on this date from prior image in January 2009). There are also recognized perforaor veins of the foot (medial and anterior and lateral) that can cause significant morbidity when they are incompetent. Peroneal perforator veins are also the 'lateral calf perforators' and are found 5-7 cm (Bassi's veins) and 12-14 cm from the lateral ankle. The peroneal perforators connect the lesser saphenous veins with peroneal veins. In the past, surgery designed to divide the perforating veins, such as Cockett and Linton procedures, were associated with considerable morbidity. The recently developed technique of subfascial endoscopic perforator surgery (SEPS) has allowed perforating veins to be divided effectively but with considerable incisions and down time. As importantly, utilization of minimally invasive techniques that have been developed by Dr. Karamanoukian using expertise he has gained as a cardiac surgeon have revolutionized these techniques into smaller incisions that allow optimal wound healing with minimal morbidity. There is hope! New technology using radiofrequency ablation and EVLT Never Touch allows for obliteration of these perforators under local anesthesia in an ambulatory office setting. New EVLT micro laser fibers allow for obliteration of these perforators in the mid calf or thigh. These ablative technologies are used selectively at the Vein Treatment Center to achieve the desired effect in healing venous stasis ulcers and treat recalcitrant varicosities that are not responsive to microphlebectomy or VNUS Closure. Remember that perforator veins can contribute to the development of trophic skin changes (bronzing of the skin leatheriness of the skin) and also venous stasis ulcers. We have the expertise at the Vein Treatment Center and www.VeinsVeinsVeins.com to treat perforator venous insufficiency - perforator venous reflux disease - perforator reflux - perforator veins. The perforating veins (PV; or “perforators”) are numerous and very variable in arrangement, connection, size, and distribution. In clinical practice, perforating veins have been associated frequently with names of authorities, often incorrectly from a historical point of view, and some-times misleading. Instead, descriptive terms designating location are preferred. Perforators are grouped on the basis of their topography. The perforators of the foot (venae perforantes pedis) are divided into dorsal foot perforators, with their equivalent term intercapitular veins, medial foot perforators, lateral foot perforators, and plantar foot perforators, according to their location. The ankle perforators (venae perforantis tarsalis) are designated in medial ankle perforators, anterior ankle perforators, and lateral ankle perforators, according to their topography. The perforators of the leg (venae perforantes cruris) are divided infour main groups. The perforators of the medial leg are designated as paratibial and posterior tibial. Paratibial perforators connect the main trunk or trbutaries of the GSV with the posterior tibial veins and course close to the medial surface of the tibia. These correspond to the so-called Sherman PV (at the lower and mid leg) and Boyd PV (at the upper leg). Posterior tibial perforators (Cockett perforators) connect the posterior accessory great saphenous vein with the posterior tibial veins. These correspond to the so-called Cockett PV. They should not be named first, second, and third. As recommended by Frank Cockett, they can be indicated topographically as upper, middle, and lower. The perforators of the posterior leg are divided into medial gastrocnemius perforators (in the medial calf), lateral gastrocnemius perforators (in thelateral calf), intergemellar perforators (connecting the SSV with the calf veins, also called "mid-calf perforator of May"), para-Achillean perforators (connecting the SSV with the fibular veins; also called "perforator of Bassi").